Soldier of Amitermes, copyright Alexander Yelich. I've referred before to my enthusiasm for termites, those wonderfully weird sociable scions of the cockroach clan. 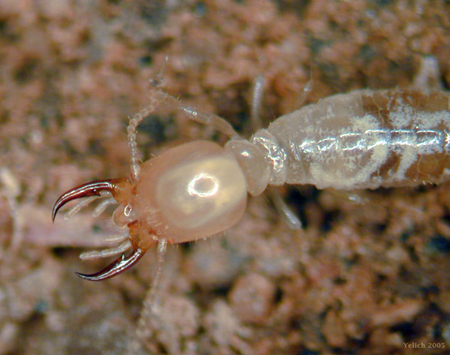 For today's post, I'm looking at one of the larger and most widespread termite genera, Amitermes. There are over 100 species of Amitermes found in tropical regions around the world, though they are most diverse in Africa and Australia. They are members of the so-called 'higher termites' of the Termitidae, those termites with a gut microbiota dominated by bacteria rather than protozoa. Soldiers of Amitermes have long sickle-shaped mandibles with a more-or-less well-developed tooth on each mandible; these mandibles are used to slash at perceived threats, the effect of this direct attack being presumably exacerbated by offensive chemicals that seep from the fontanelle, a pore on the front of the head capsule. Members of the genus are diverse in habits: some build sizable mounds above ground whereas others live in small colonies in underground tunnels. 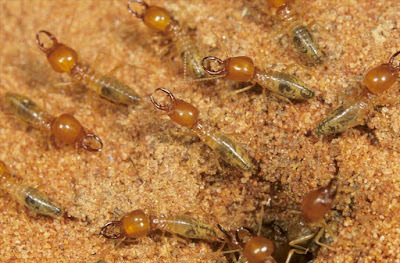 Some show a distinct preference for living in the nests of other termites, either moving into abandoned mounds after the original owners have perished or squatting in some overlooked corner of an active nest. Nests may be built directly around a food supply, or workers may go out to forage for food to bring home. 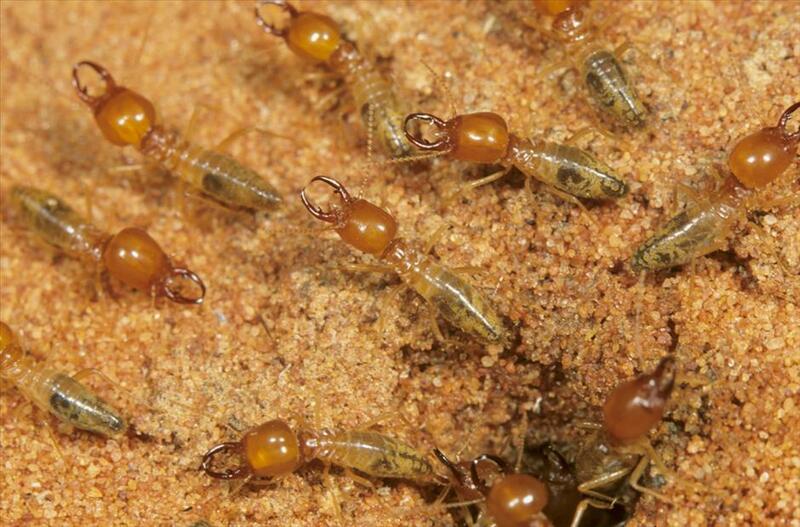 In the latter case, the workers may construct a covered tunnel for themselves as they go; these trails may commonly be seen running along the ground in areas where such termites are abundant. Many Amitermes species feed on wood but they may also take other vegetable matter such as grass. A number of species feed on the dung of herbivorous mammals such as cattle or horses (Gay 1968), digesting parts of the consumed plant matter that the original feeder could not. One West African species, A. evuncifer, is a significant pest of crops, attacking root vegetables or the roots of young trees. Hill (1942) noted that mound-building Amitermes could present difficulties beyond just their feeding habits, explaining that "The frequent destruction of nest of [this genus] is perhaps the most important task of those employed in the maintenance of certain northern aircraft landing grounds, for the removal of the original nest almost invariably is followed the erection of another of a size and consistency that contributed a potentially dangerous obstacle to landing or rising aircraft". Magnetic termite mounds, copyright David King. Perhaps the most famous members of this genus are the 'magnetic termites' of northern Australia. These are three species that build mounds that, instead of being conical or globular like the mounds of other species, are long and narrow, almost blade-like. Even more strikingly, they are lined up almost exactly along a North-South axis, with at most a 10° deviation. Experimental alterations of such mounds indicate that the termites are indeed sensitive to the direction of magnetic fields though other factors such as local climatic conditions may also play a part. The shape of magnetic mounds is usually interpreted as an adaptation for temperature regulation: at the cooler ends of the day, the mound is receiving the full effects of the sun but during the hot midday only the thin upper edge is in the line of the light. However elegant an explanation this may seem, however, it overlooks the detail that a more standard globular mound is actually better for heat regulation overall. Round mounds have a much lower surface area-volume ratio and hence a lower rate of heat diffusion. Blade-shaped mounds may absorb heat quickly in the morning but they also lose heat quickly at night. An alternative explanation for the mounds' shape may lie in where magnetic mounds are found. It is worth noting that only one of the Amitermes species concerned, A. meridionalis, is an obligate constructor of blade-shaped mounds; the other two species, A. laurensis and A. vitiosus, may build either conical or blade mounds depending on local conditions. Magnetic mounds are constructed on flat flood plains, so the termites living inside them build up stores of grass to provide food when flood-waters prevent them from foraging outside the nest. By allowing better air flow within the nest than a conical mound, the blade-shaped mounds allow food stores to remain edible for longer, reducing the risk of them expiring before flood-waters recede (Korb 2011). Temperature regulation is still the best explanation for the regular orientation, of course, but is probably not the primary cause for the mound form overall. Drepanotermes rubriceps soldiers around a nest entrance, copyright Lochman Transparencies. Phylogenetic analysis of the termites by Inward et al. (2007) indicated that the genus Amitermes as currently recognised is probably not monophyletic, being paraphyletic to at least the Australian genus Drepanotermes. Members of this latter genus are grass-feeders, particularly on the hard Triodia (spinifex) grasses that dominate large parts of arid Australia (and which few animals without the super-charged termite digestive system can eat). In my experience, Drepanotermes are one of the few termite genera that can be reasonably easily recognised from the workers alone, which are noticeably longer in the legs than other termites. 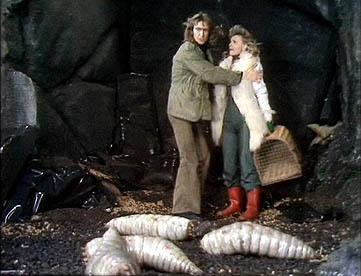 I've often seen Drepanotermes workers out foraging at night; the entrance to the underground nest (a simple hole) can usually be found nearby. The soldiers do not usually emerge from the nest, but a group of them will sit in the entrance hole with their heads poking out to provide defence. When collecting specimens, I've found that the challenge is to move fast enough to grab a soldier before it zips back into the tunnel, escaping your grasp. Gay, F. J. 1968. A contribution to the systematics of the genus Amitermes (Isoptera: Termitidae) in Australia. Australian Journal of Zoology 16: 405–457. Inward, D. J. G., A. P. Vogler & P. Eggleton. 2007. A comprehensive phylogenetic analysis of termites (Isoptera) illuminates key aspects of their evolutionary biology. Molecular Phylogenetics and Evolution 44: 953–967. Korb, J. 2011. Termite mound architecture, from function to construction. 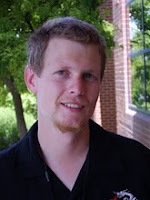 In: Bignell, D. E., et al. (eds) Biology of Termites: A Modern Synthesis pp. 349–373. Springer.